To help appreciate how fabrics & wallcoverings will work in your home, sample swatches are available to order online for a small charge. If you see a fabric or wallcovering that you like whilst browsing the collections, simply click on the ‘Order a Sample’ button or icon to add a swatch to your basket. Sample swatches are delivered free of charge within the UK & Republic of Ireland and take approximately 3-4 days to arrive. You will be notified of any out of stock products. 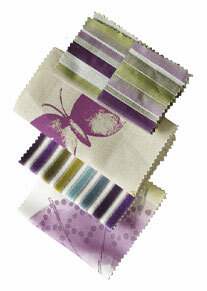 Samples swatches are intended as a colour and texture sample only and may not show the full design. Every effort is made to ensure that the products supplied correspond as closely as possible to samples or images shown in our pattern books, swatches, brochures and website, however, variations in colour between batches may occur from time to time during normal manufacturing processes. If a particular shade is critical then please contact your local Interior Designer / Retailer to order a stock cutting for approval. World Wide delivery of sample swatches is available through our global stockist network. Please click here to find your local stockist.